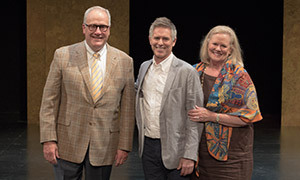 When you make a gift to the Indiana Repertory Theatre's Front and Center Campaign, you are supporting the immediate needs of the Theatre while also ensuring its long-term sustainability. Watch the video below to learn more about our exciting plans for the IRT! We welcome people from diverse backgrounds to unite in a common space and experience stories that explore the primary issues of humanity. Together as audience members, people connect, discuss, and reflect. 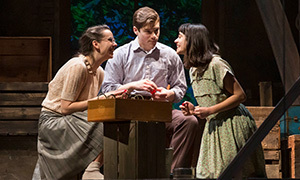 Through a compelling array of classic, contemporary, and world premiere plays, we captivate audiences with stories rendered on our stages expertly by professional artists and artisans. By providing quality, interactive arts experiences to over 40,000 Indiana school children each season, we play a vital role in developing empathy and critical thinking skills in the future generation of Hoosiers. As a locally operating small business, we create jobs, attract patrons to shop and dine Downtown, and provide an essential cultural amenity that helps other local businesses attract and retain top-flight talent to Central Indiana. Check out the Campaign Brochure to learn more about the Front and Center Campaign. Contact us using the information below, or click to learn about the ways to make a gift! 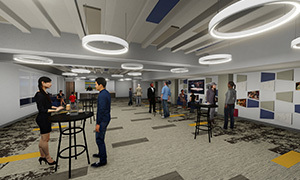 The IRT will be accepting pledges to the Campaign through March 2020. Pledge payments will be accepted for an additional five years, through March 2025. You can make your gift via credit card, personal check, stocks or mutual funds, or through the IRA Required Minimum Distribution. We will also be accepting legacy gifts as a part of the Campaign. 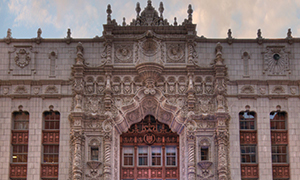 Visit our Legacy Giving webpage to learn more about making an estate gift to the Theatre.